In January 2018, I attended an art retreat with Jen Cushman in beautiful Southern California at Pom Intra's (Prima Marketing) stunning home. It was an amazing 5-day retreat with unbelievable women pouring out our creative hearts with our hands. At this retreat, I met Patti Euler, owner of the infamous Queens Ink in Savage, Maryland. During our time together she told me about Manneqart because of the paper dresses that I create. I could not believe what I was hearing, I found my tribe. I was asked to join the competition and set to work on my project. 7 months later I flew to Maryland to teach at Patti's store and participate in the competition. Spending the time we had at the Manneqart facility, Lee Andersen taking the time to create a cowl for the second model, all the hundreds of bolts of fabric, it was an amazing experience. The dress ended up being modeled by two beautiful young women, it took hours to get them into it and out of it, but it was so much fun. I loved being in that environment, I can't wait until next year. Thank you again, Patti for inviting me and in helping me to find my tribe, I did not know there were other people out there like me. I am so happy to have won two awards and am humbled by the whole experience. Now to get started on next year, and how do I outdo myself? The final dress when on the model was 8 foot tall with a 7-foot wingspan. Thank you to my amazing sponsors Canvas Corp Brands Tattered Angels, Makins Clay, Beacon Adhesives, Rustoleum Testors, Prima Marketing, Inc. and my girls, Julie Koulouris and Stacy Countiss for your help with punching 100s of butterflies and cutting those amazing branches. 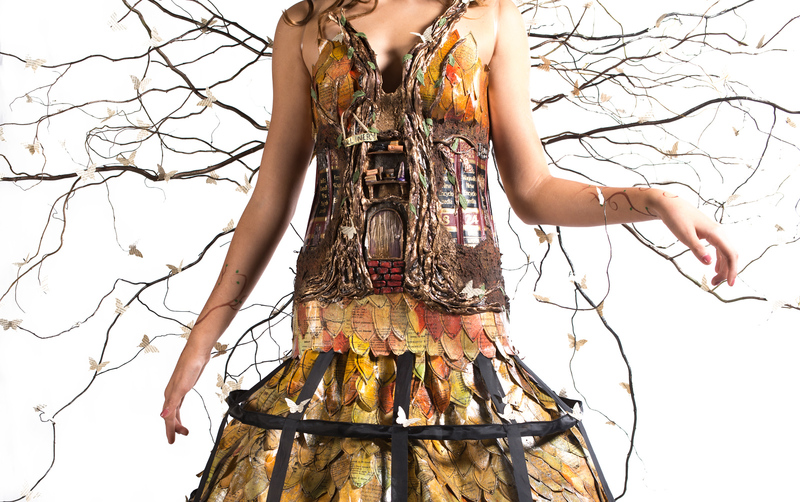 This dress was made of vintage book pages, old encyclopedia spines, colored spray, polymer clay, glitter paint and a lot of time and patience. 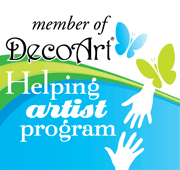 (Laurel, MD) November 15, 2018 – ManneqART, an international arts and education non-profit, today announced the winners of its 2018 (Sixth Annual) national Sculptural Artworks Competition. 54 artworks were submitted to this year’s competition which, since 2013, has received more than 300 entries. This year’s Competition featured themes of fantasy, love, metro and mechanical and also included a Bra Art Competition which received 15 entries. Winners were selected by a team of six expert judges who used the criteria of originality, craftsmanship and adherence to theme in making their decisions. Theme winners each receive a $1000 cash award. This year, the judges chose NOT to select an overall Master Award winner, deciding instead to select two Fantasy Theme Award winners because of the large number of Fantasy Theme entries received. The winners are Bloom by artist Meg Schapp of Potomac, MD and Ethereal Fairy by artist Candy Rosenberg of Grants Pass, OR. Ethereal Fairy receives the 2018 Innolect Corp. Growing Leaders Award. Love Theme Award—The Love of the Freed Family, a collaboration by members of the Freed family of Pennsylvania, Massachusetts, and Florida, honors the 94th birthday of the family matriarch, Helen Adams Freed. At a family reunion in July, 32 family members each created a unique flower and all 32 were incorporated into a wearable sculpture by ManneqART volunteer artists Lexi Sands and Sherry Kirn. Bra Art Competition winner is Cuckoo Cups by artist Grace DuVal of Chicago. 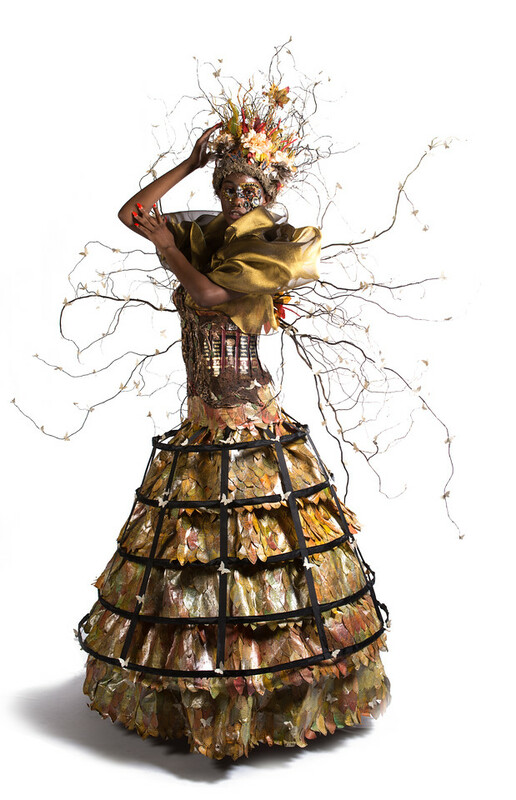 This artwork was previously shown at the 2016 World of Wearable Art Competition in New Zealand. High School Award ($300) Frozen Light by Southern High School in Harwood, MD. Middle/Elementary School Award ($200) Kinder Garden by beginning artists attending a 2018 ‘Makers Fair’ in Columbia, MD. ManneqART recently presented all this year’s winning artworks at a two-week exhibit sponsored and hosted by The Mall in Columbia. ManneqART routinely exhibits sculptural artworks at venues in and around Howard County and is planning to make artworks available at more locations in 2019. ManneqART's 2018 Awards Reception is scheduled for Sunday, December 9, 5-8 PM at the new ManneqART exhibition in the New Weave Building at Historic Savage Mill. Plan to attend this fun event featuring this year's winning artworks on live models. Bring your friends and relatives. Light snacks and beverages will be offered. ManneqART is a 501-(c)-3 arts and education nonprofit and annual sculptural artworks competition based in Howard County, MD. 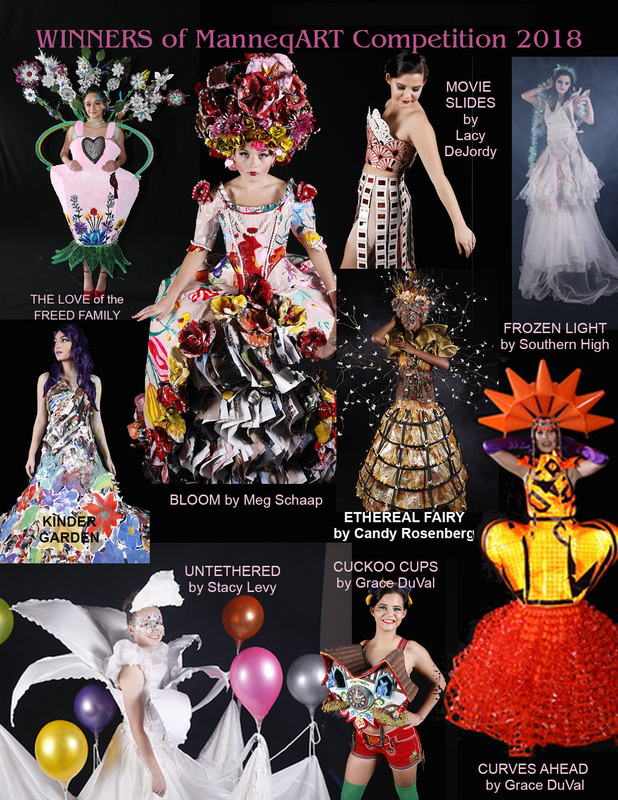 Now completing its sixth year, the ManneqART mission is to inspire creativity, teach problem solving skills and reward excellence in the field of wearable art. 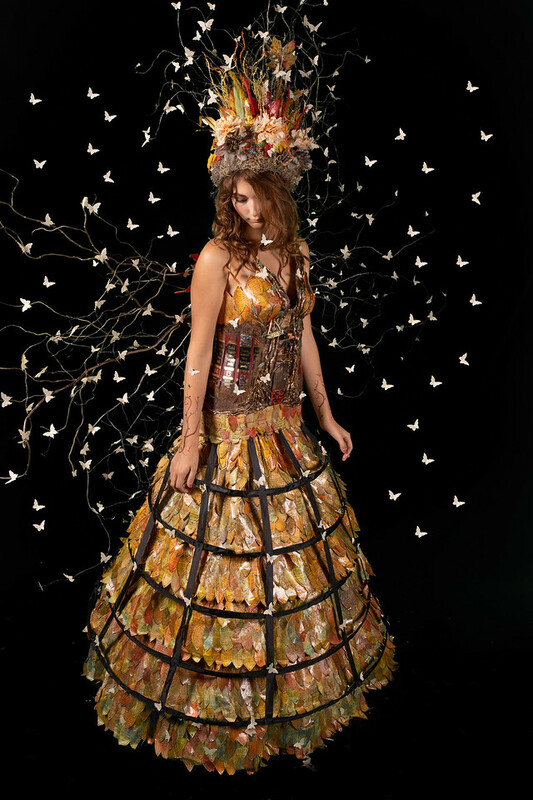 Wearable art is 3D/sculptural art that can be displayed on the “human form.” To enter the 2019 ManneqART Competition or for general information visit: www.manneqart.org.